I work in an apple orchard. I love it. I enjoy working out in nature. There is something magical about working with my hands and moving about in this lovely temple with the sun on my skin, the morning dew tickling my hands and arms and the wind cooling my face. Sometimes the rain dances from leaf to leaf to finally get caught in my hair. Some days it is so cold that a hot tea with a hint of ‘Schnapps’, sipped sitting in the old bee house with my workmates, is a wonderful thing to do. Some days it is so hot, that drinking cold freshly pressed apple juice is heavenly. Picking apples really is an art. Apples want to be picked with love and gentleness and yet with enough confidence and firmness that easily they let go from holding on to their tree. An apple is not just an apple! 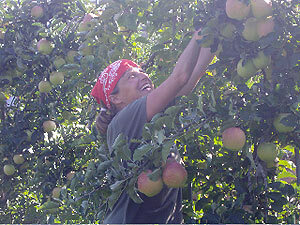 Some apples are just right to pick when their cheeks are a shiny blushing red. 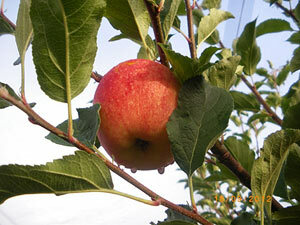 Some apples prefer a light touch of red mixed with lots of yellow-green. Others are almost plum blue and would fancy being picked by me wearing my white silk gloves, if they could have it their way. For me these delicate differences make picking so interesting. While both of my hands eagerly reach out to pick the apples, I have to quickly choose which apples are perfectly ready to be picked. I work in a cool team. The members of my team love to be working out here just as I do. Especially my boss loves his work and is therefore a knowledgeable, inspiring work companion. Moving about and being busy concentrating on the job, keeps my brain happily occupied. This fact leads to a wonderful phenomenon: my heart is wide open. There are no secrets under the apple trees. It is impossible to talk negative in this glorious environment. Every attempt to do so, sooner or even sooner turns around into a happy experience. My boss has found a belief, that means a lot to him. He lives by his belief beautifully. One day, the two of us got talking about religion and god. I asked a lot of questions about his belief. Our talk left me deeply touched. If the two of us could judge, comparing what we believe in, we would probably disagree over many points. Yet this is not what our talks are all about. It is not about judgment. I have a deep respect for my boss. What touches me most is his honesty, his pure way of sharing what he believes in and what he lives by. He talked about his belief with such joy and enthusiasm; never once insisting I should believe his belief or live by his way. He was simply sharing with me what is in his heart of what his life is about. That day, I left the orchard feeling honored. I believe it is not about what religion or philosophy we choose. It is whether I follow what I choose 100 percent. Do I live it happily with all that I am? Do I honor my fellow men and nonjudgmentally let them live their beliefs? My joy is to be happy living mine. There certainly is peace on earth with this attitude. There is peace in Christian’s apple orchard. It is magical, working in an orchard. It really is a place of sharing unconditional love.